Windows 7 is one of the most amazing product I have ever used. As a debugger and reverse engineer in this new phase of my career, I tried to understand this OS from its very core. Though the core is mostly the same as that of Windows Vista but has been heavily optimised for performance with lots of powerful edition that will surely bring smiles and satisfaction to end user. Vista was an interim release of this new operating system code but was severely cut down in features because of some diversion of interest into WinXP and Server 2003 as the need of time. However Windows 7 is far ahead of what we imagined looking at Vista! One of the greatest issues that haunted Microsoft from making their customers move from XP to Vista was the application compatibility issue. There has been a slow progress in application migration from XP to Vista and thus resistance in upgrading the OS. However, Win7 addresses this very well and I am sure consumers will accept this new OS pretty easily. 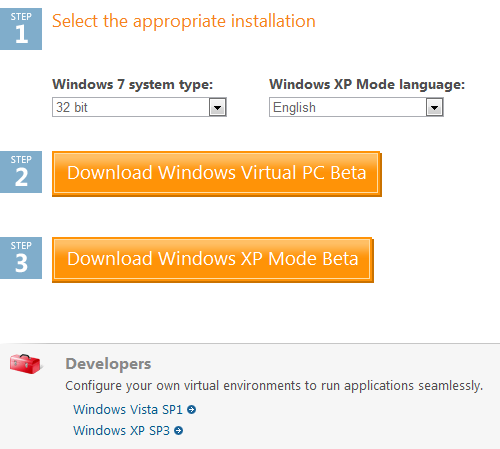 Virtual PC beta is available to free download for Win7. 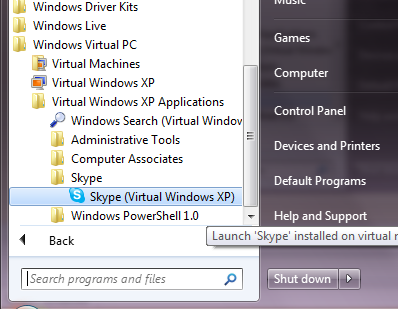 With Virtual PC beta and XP Mode beta you can run XP compatible application on windows 7 which otherwise fails. Shim was a well known approach to application compatibility but this approach of vitalizing is amazing. Windows XP SP3 virtual machine runs in the virtual pc beta and any application installed in it is then accessible from the host – Windows 7. We need AMD-V or Intel VT hardware virtualization support to have Virtual PC. I think 64 bit hardware comes with this default. We must ensure from BIOS that it is enabled. If not, check for a BIOS update. On my quad code Hp Workstation XW8400, a BIOS update did the trick. Before we move ahead a little addition here that XP Mode is available only for Professional and Ultimate editions. Virtual application support is available for Windows XP, Windows Vista and Windows 7 running in Virtual PC beta and not for any other Windows operating system, but our interest is in Virtual PC beta which is available for Home edition and can run any 32bit Windows operating system. I haven’t tried this with Linux and any other operating system in Virtual PC, but what we are going to see next is of more interest to windows kernel developers and debuggers. 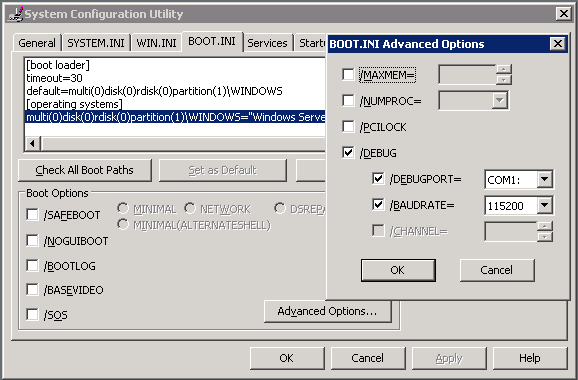 On your Windows 7 installation machine, check BIOS and verify that Virtualization support is enabled. You may need to refer to your hardware vendor manual to find where to enable it from. This link may help. For a note: as the default virtual machine runs on 512 MB RAM and Windows 7 also needs 1 GB for smooth performance, you need to ensure that you are doing this on a good configuration. 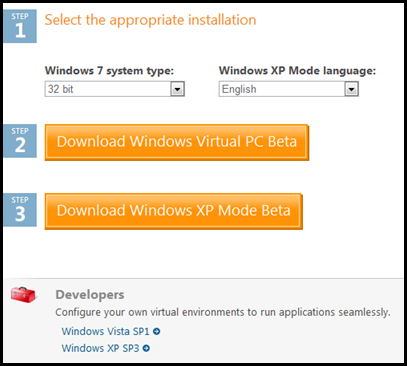 Boot your machine to Windows 7 and go to Virtual PC Beta download site. Here you can download Virtual PC Beta (4.88 MB) and Windows XP Mode Beta virtual machine (445 MB). Download and install both of them. Boot your Windows XP Virtual machine by selecting it from the program files link. It will ask you login details. Don’t forget to save your password so that virtual machines logs you in automatically on boot every time. 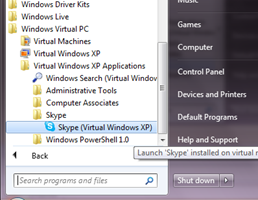 Once your virtual XP is running, look for “Install integration components” in Tools menu on top. 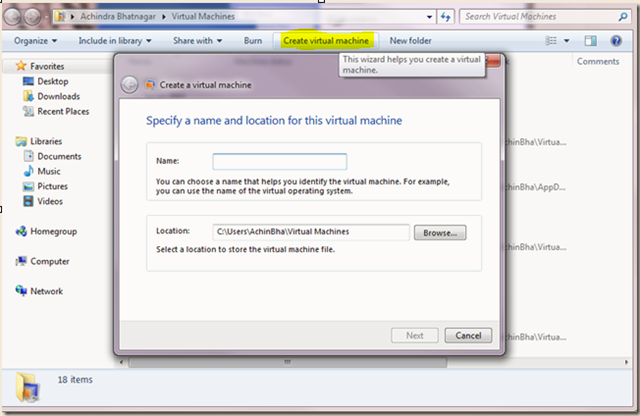 This will enable mouse, keyboard and clipboard sharing between the host and virtual machine. Also you get access to host machine drives. 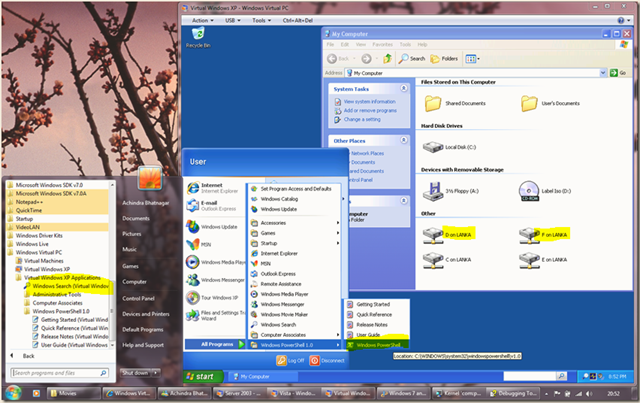 Virtual PC Beta running Virtual Windows XP with applications that can be accessed form host machine and host machine drives accessible as network mapped drives. This was all about Windows XP and using it for installing and running applications. However I shall write one more blog about Application Compatibility some time later, but for now lets concentrate on using this for debug and learning. My personal favourite is a Windows 2003 server that I like to debug and learn. 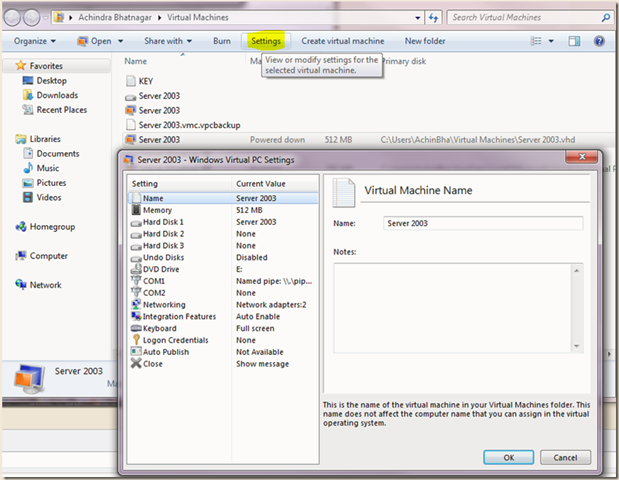 From Program Files > Virtual PC, Select Virtual Machines explorer. A new virtual machine can be created from here. Use 512 MB RAM with 10 GB Fixed disc. That should be sufficient. Once you have created the base image you can configure and install operating system in your virtual machine environment. Now boot your virtual machine, install the OS and apply security updates. Install integration components and get ready for the real fun. As our virtual machine has already been configures to redirect COM port data to a pipe, we now need to configure guest machine to use this port for debug and the host machine debugger to connect to the guest machine debug port through this pipe. First we will configure the guest machine. Now that our kernel is ready to boot to debug, we can configure Windows debugger on host machine. 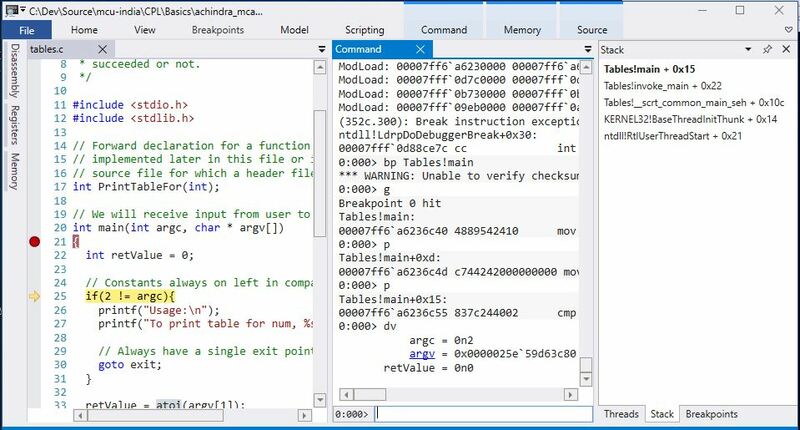 You can download this debugger from WDK and Developer tools site for free. Install your debugger to C:DEBUGGERS. You may also need to download and install public symbols from the same DevTools site. Install symbols to C:SYMBOLS if you do not have any space constraints. These paths will be easy to access when you access them from command line. 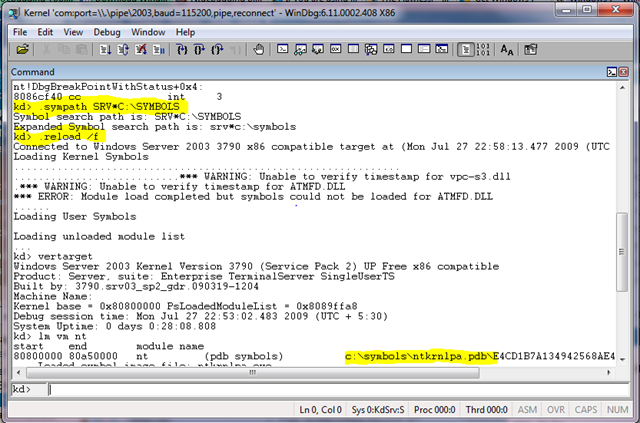 Start Debugger, File > Kernel Debug and configure as following to connect to the debug machine’s COM port through the pipe. Once your debug starts waiting for a connection, you can press Ctrl+Break to break into the debug kernel and configure your environment for debugging. You have setup symbols, now setup a few break points and let it go. Your virtual machine will defreeze and you can continue to work on it and whenever you hit the breakpoint or exceptions are thrown around, you get the control back in debugger. There you can analyze the call stack and do whatever you want with the guest operating system.